Android Is King – of Malware Threats! 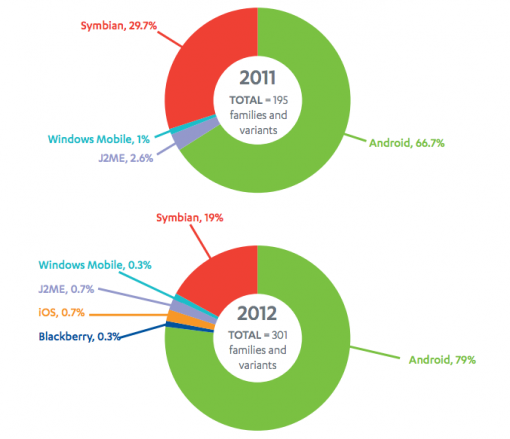 Mobile security company F-Secure has recently released a report on the status of mobile threats in 2012. The report covers a lot of ground, but the most striking result is that Android is the main platform being targeted by hackers. From the get go, the executive summary of the report picks out Android. Android malware has been strengthening its position in the mobile threat scene. Every quarter, malware authors bring forth new threat families and variants to lure more victims and to update on the existing ones. In the fourth quarter alone, 96 new families and variants of Android threats were discovered, which almost doubles the number recorded in the previous quarter. A large portion of this number was contributed by PremiumSMS—a family of malware that generates profit through shady SMS-sending practices—which unleashed 21 new variants. It is worth noting, however, that Android has grown significantly in the past year. The same report states that from 2011 to 2012, Android’s market share has grown from 49.2% to 68.8% – definitely a huge leap that has to be taken into consideration when analysing the numbers of mobile threats! If you think about it, it’s just like the Windows-Mac situation. There used to be a time when Mac users could rest easy knowing that they would “never” get attacked. That was because barely anyone used Mac. With how it is popular today, Mac is not entirely immune to malware. Now how about other mobile systems? How do they stand in this regard? Blackberry, Symbian, and Windows Mobile are not without malware threats, but it really is nothing like Android. Does this mean users should just ditch Android? I think not. Android may be king of malware threats, but users are not without the means to nip them in the bud. And, after all, if you really prefer using Android, that should outweigh the possibility of those threats. That does not mean I am going to switch to Android in the foreseeable future, though!